Data for numbers of stomata rows indicate geographical relationships in Asian Taxus are more complex than in North America and Europe; however, they become clearer when other taxonomic features are taken into consideration—as indicated by the species recognized. For example, in the western Himalayas, I recognize T. contorta—where found with 5–8 (-10) or 8–11 stomata rows (Fig. 2C)—by the long narrow leaves that have sclerified parenchyma cells not seen in other species of yew, and by other leaf traits, particularly the elliptical shaped epidermal cells in T-section; collectively, these features indicate the W Himalayan yew is more closely related to yews in Europe than to yews in Asia. Similarly, in the E Himalayas I recognize T. wallichiana—where found with 11–19 stomata rows—by leaves having angular shaped epidermal cells in x-section, by the persistent bud-scales at the base of branchlets, and by branchlets that show a marked color change in their 2nd yr of growth—from yellowish green to maroon or reddish orange; collectively, the morphological features of T. wallichiana have more in common with yews of SW China than with the W Himalayan T. contorta. 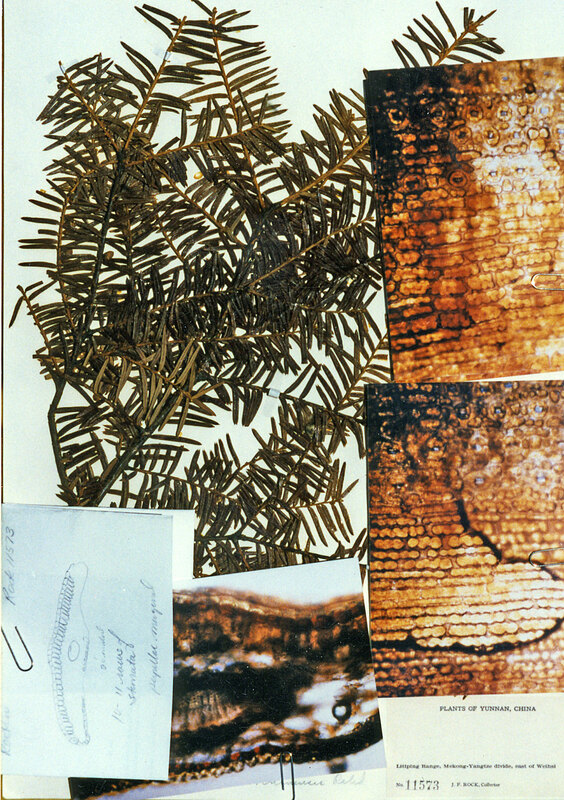 The Wallichiana (Species) Group is characterized by leaves having reddish epidermal cells and scarcely differentiated stomata bands as seen in dried specimens. The reddish color, which is most conspicuous on the non-stomatal epidermal areas (adaxial surface, abaxial surface between stomata bands and margins, abaxial midrib), apparently is a product of oil (terpenoid [taxoids] or resin) droplets in cells that become red and deposited on cell walls as leaves dry and deteriorate with age in the herbarium. 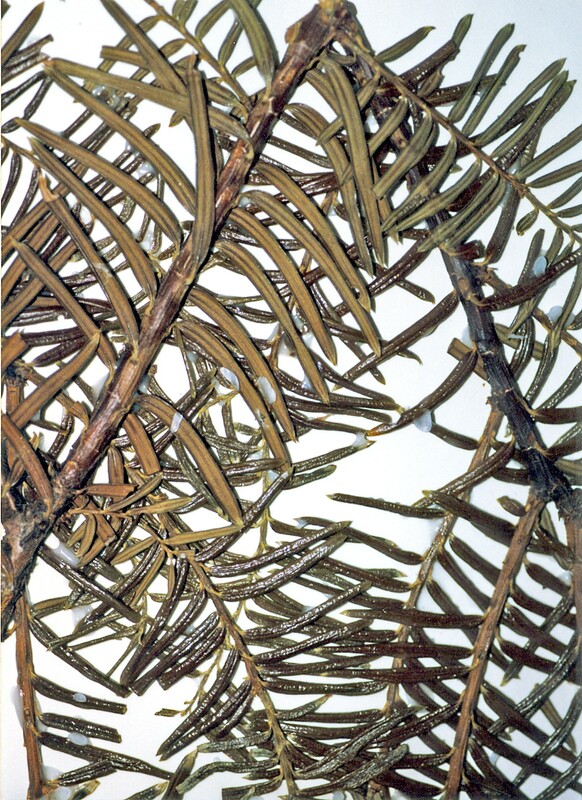 Resin in conifers is usually secreted into ducts, but Taxus does not have resin ducts. Dried leaves in other species groups usually lack reddish epidermal cells, although similar cells do occur in the mesophyll of the Baccata Group (T. baccata Alliance). Their non-stomatal epidermal cells—that appear short elliptical in transverse sections—are often colorless, while the color that is evident is due to chloroplast in the underlying parenchyma cells. In the Baccata Group, leaves appear dark olive to yellowish green with little differentiation in color of stomata bands. The Sumatrana Group, which shows more differentiation of color, has blood red to yellowish green marginal and midrib areas in contrast to stomata bands appearing olive green to yellowish orange in chloroplast, yellowish orange on cell walls, and yellowish green on papillae. The color differences between these three groups are obviously chemically related, but despite the wealth of chemical data published on the genus, studies lack authoritative taxonomic documentation. Two subgroups of species are recognized in the Wallichiana Group—by the shape of leaf epidermal cells in transverse section. The Wallichiana Subgroup—characterized by taller than wide to nearly isodiametric epidermal cells in transverse section—ranges from the E Himalayas to Yunnan, Sichuan, and W Hubei at elevations between 2000 and 3700 m, and is also found in North America from near sea level to above 2000 m. The Chinensis Subgroup, which has ±elliptical epidermal cells in transverse section, occurs mostly in central China between 300 and 2500 m in elevation, but extends to Nepal, The Philippines and to Indonesia where found mostly above 2000 m. The Chinensis Subgroup includes plants with rectangular to nearly quadrangular epidermal cells if most other characteristic features of the subgroup are evident such as the vestigial bud-scales at base of branchlets, yellowish tinted (ochre) branchlets, oblong leaves, leaf stomata aligned in transverse rows, and a leaf midrib that is leaves partially papillose. The Wallichiana Subgroup is regarded ancestral to other taxonomic groups. An ancestral species might be characterized as appearing columnar in habit, having conspicuously nerved bud-scales that persist at base of branchlets (T. suffnessii), radial spreading leaves as in T. fastigiata (Baccata Group), long), having tall angular leaf epidermal cells and having leaf stomata in rows that extend across the entire abaxial surface as in T. suffnessii. Except for SW China endemic, T. florinii, the North American taxa are more narrowly defined with fewer stomata, less than 12 stomata rows per band (Spjut, 1992, 1993, 1998a, 1998b, 2000c) in which stomata vary from (7-) 8–9 (-11) stomata rows in Taxus globosa var. globosa, from (5-) 6–7 (-8) rows in T. globosa var. floridana, and from 4–7 (-9) rows in T. brevifolia. 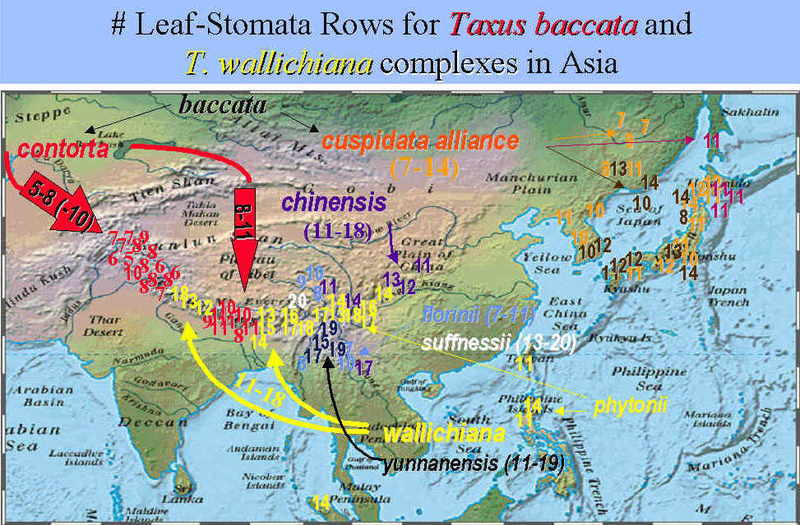 In contrast, Taxus wallichiana, occurring from the E Himalayas to SW China, may have anywhere from 11–19 (-21) rows, or stomata in T. florinii in SW China may range from 7–12 rows per band. The leaf anatomical features are given more taxonomic weight in the Wallichiana Group than in other species groups. 2. Taxus florinii Spjut, J. Bot. Res. Inst. Texas 1(1): 222. 2007. —Type: China. Yunnan: Litiping between Likiang and Weihai, tree 17 ft, in mixed forests by stream, R.C. Ching 21980, holotype: A! (Fig. 193, stomata 10 rows/band, abaxial marginal zone 5–6 cells across, these thick-walled). Florin yew. Distribution: Forest or pasture or along streams, 2500–3700 m; China (Xinjiang Uygur, Sichuan, Yunnan). 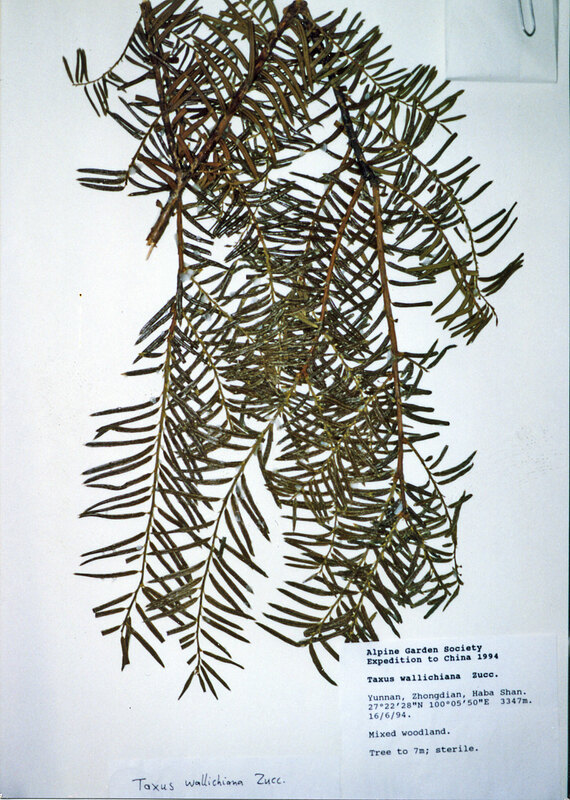 Shrub or tree to 13 m high; young branchlets yellowish green, abruptly changing to reddish purple in 2nd yr; bud-scales persistent on 1–2 yr branchlets in most specimens, 2–3 seriate, deltoid, concave, ca. 0.3–0.5 mm long, obscurely to prominently carinate, closely attached. 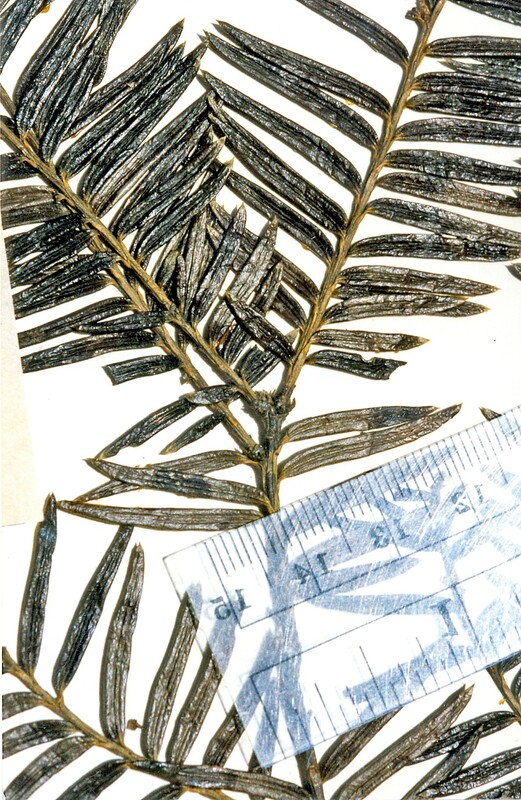 Leaves arranged ±distichous, homomallous, linear-lanceolate, acuminate, straight to falcate, 1.5–3.5 (-4.7) cm long, 2.0–4.0 mm wide, 200–350 µm in thick, dark glossy green above (dried leaves, similarly noted by collectors on fresh specimens), glaucous to yellowish green below (in dried specimens, also noted as yellow green in field), slightly convex above (adaxial) to a rounded midrib, channeled along each side below mid region to base, less concave below (abaxial) to a flush to slightly rounded midrib, margins plane to slightly revolute; upper (adaxial) epidermal cells nearly quadrate in transverse section, occasionally taller than wide, 20–50 µm tall, 20–40 µm wide; lower (abaxial) epidermal cells narrower and not as tall as upper along midrib and marginal regions, rounded to partly angular in transverse section, 5–12 µm tall, 15–25 µm wide, numbering 16–20 across marginal region, trapezoidal to short rectangular, 1–3× l/w near margins, longer nearer stomata bands, 3–5× l/w, and on midrib, 5–10×+ l/w; papillae lacking near margins on 2–10 cells across, positioned more marginally than medially on midrib in 1–2 alternating rows, medially to marginally on accessory cells, and along cell walls in marginal zone; stomata bands narrower than marginal zones; stomata in 7–12 rows/band. Male cones maturing on 1st and 2nd yr twigs, subcylindrical in bud, 3 mm wide, 4 mm long, yellowish green, the scales 4–5 seriate; microsporangia 5–6 on each sporophyll, pinkish, spongy. Female cones initiating on current season growth, subcylindric in bud, 2–4 mm long, maturing 1st and 2nd yr, or on much older branchlets in one specimen, the scales 5–6 seriate; seed ovoid to globose, to 5 mm long, 5 mm diam., pale (yellowish) in color, sharply pointed at apex, covered in part by red aril, Aug.
Representative Specimens—China—Sichuan: handwriting illegible, 3500 m, Schneider 1429 (K); Ngaitaschekou trans flumen Yalung ad septentr oppodi. Yenyüen, 28º15’N, 2800–3500 m, Handel-Mazzetti 2602 (K); Shalie Valley on Muzhiyan Shan above Old Muli, Muli country, ca. 2980 m, frequent in narrow, steep SW facing gulley, tree to 5 m, leaves dark green above, yellowish green below, Fliegner et al. 1129 (K). Xinjiang Uygur (“Soc. W. Sikiang”): “NW Yunnan,” Tamichung, tree 20–30 ft, in fr., open pasture, R.C. Ching 21505 (A). Yunnan: NW: Mt. Fo Ludu, NW of Li-Kiang, W of the Yangtze, J.F. Rock 18502 (A, US); mostly illegible, 3000–3200 m, C. Schneider 2918 (A, K); no locality data, T.T. Yu 11076 (A); Dokerla, 3100 m, Yu 7848 (BM); Litiping Range, Mekong-Yangtze divide, E of Weihsi, J.F. Rock 11573 (A, US); Sikang, Me-kong, Tsa-wa-rung, 2500 m, C. W. Wang 65475 (A); Mekong-Salween Divide, Forrest 19967 (S: C-2084); S Chungtien, Kung-shiang-shu, Snow Mt on the way to Kai- Lou-wei, on Yangtze bank, 2700 m, by stream in wooded side of valley, tree 20 ft, K.M. Feng 3235 (A); same locality, 3200 m, in mixed forest, shrub 15 ft, in fruit, K.M. Feng 1809 (A); Wei-si Hsien, 2500 m, forest, C. W. Wang 67735 (A); Zhongdian, Haba Shan, 27º22'28 N, 100º05'50 E., 3347 m, Alpine Garden Soc. Exped. 309 (K). The Florin yew is a polymorphic species with a geographic distribution restricted to mostly Sichuan and Yunnan. It differs from T. wallichiana primarily by the relatively narrow stomata bands on leaves, usually with 7–12 stomata rows per band; however, stomata density in this species appears correlated with other developmental features such as the width of the stomata band relative to that of the abaxial marginal region, and differentiation of marginal cells by width and thickness of cell walls. These features vary most in specimens from SW China. Further study is needed to determine if some specimens listed under T. florinii could be assigned to T. wallichiana var. wallichiana by giving more taxonomic weight to the number of marginal cells lacking papillae, while the number of stomata rows is currently regarded as a practical solution for separating T. florinii from related species. Additionally, T. florinii consistently differs from T. wallichiana var. yunnanensis in having papillae oriented more marginally than medially on abaxial epidermal cells, but this is not easily determined without experience. 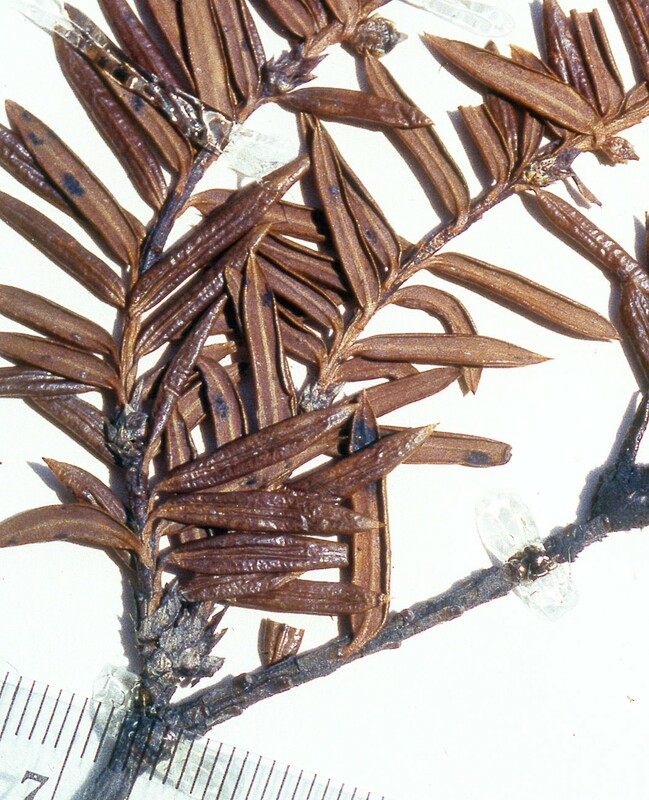 Moreover, it appears that these taxa might be more clearly defined by recognizing another variety or species based on leaves appearing more distantly spaced and having strongly discolorous surfaces as seen in one specimen under T. florinii and another under T. wallichaiina var. yunnanensis. Although T. florinii is distinguished from T. wallichiana by having fewer than 13 stomata rows per band, the distinction from North America species is not as clear. Schneider 2918 from Sichuan, for example, is similar to T. brevifolia in having 7 (–9) leaf stomata rows per band bordered by short broad irregularly shaped marginal cells, while Handel Manzzetti 2602—also from Sichuan—with 11 leaf stomata rows per band—is not easily distinguished from T. globosa. Thus, T. brevifolia and T. florinii could be considered synonymous with the America T. globosa. The American species generally differ in the pale yellowish orange branchlets and leaves appearing convex across the adaxial surface, in contrast to the dark purplish branchlets and nearly plane leaves of T. florinii. Other differences require transverse leaf sections in which the non-stomatal epidermal cells of T. florinii appear smaller with thicker-walls and less sharply angled on the abaxial surface than on the adaxial surface; in the American species, the epidermal cells appear similar in size on both surfaces. Again, more study is needed to better define the distinguishing characteristics between these species. Alternatively, one may include the aforementioned yews of Americas and Himalayas (to SW China) under T. wallichiana. Such a broad species concept, however, would be difficult to accept from a biogeographical view. Essentially, characteristics of the three species groups in this study could be referred to as species, and those of the subgroups could be interpreted as subspecies, or one may even prefer the single species concept for the genus, one that I find difficult to accept in view of the long evolutionary history in the genus. The epithet is in honor of Rudolf Florin who published extensive studies on taxads employing leaf anatomical characteristics. Despite some controversies surrounding his ideas on taxad evolution—such as proposing that they be treated in a new class, I have found his reviews and data to be of great value. Yunnan: 3000-3200 m, Schneider 2918 (A). See key for illustration of leaf sections. 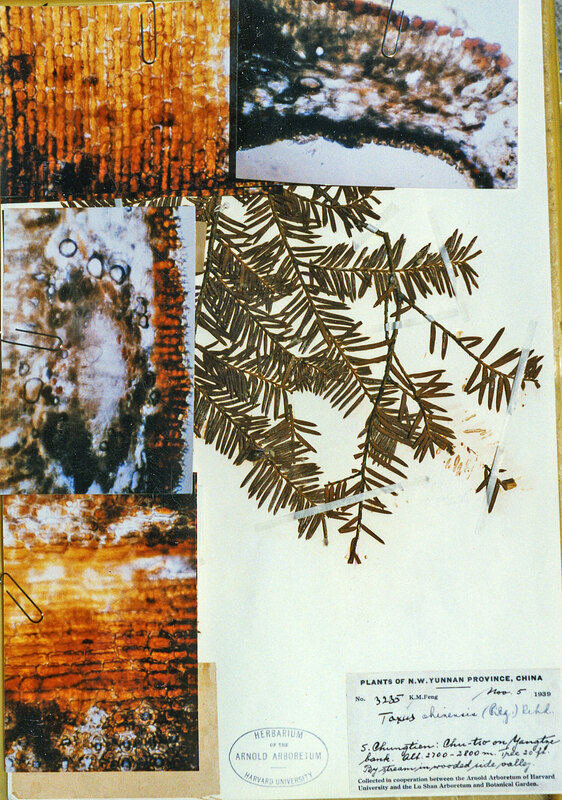 Photos attached to specimen scanned separately and shown below. This photo shows a section of the abaxial surface near mid region of leaf as seen under a microscope, from margin (left), narrow stomata band with 9 rows of stomata (center), and midrib cells with alternate (marginal) papillae on right. Illustration indicates epidermal cells are 40 µm tall and wide. Yunnan: Dokerla, 3100 m, Yu 7848 (BM). Temporary annotation label indicated for T. florinii. See key for illustration of leaf sections. Yunnan: Litiping Range, J.F. Rock 11573 (A). Photos attached to specimen show abaxial leaf sections magnified ~400x. Note marginal papillae. Illustration indicates 10-11 stomata rows per band. Yunnan: S Chungtien, Kung-shiang-shu, Snow Mt, 2700 m, Feng 3235 (A). Photos attached to specimen are of various leaf sections viewed under a microscope at ~250x. Upper left is of midrib cells with papillae aligned along the center and also conspicuous along the margins, upper right is x-section showing large epidermal cells in red; center left is of the vascular bundle; lower right shows part of stomata band, marginal cells with predominantly marginal papillae. Yunnan: Sikang, Me-kong, Tsa-wa-rung, 2500 m, C. W. Wang 65475 (A). 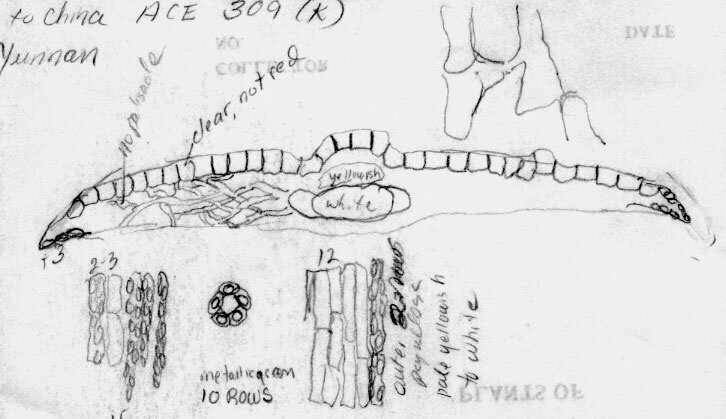 Illustration attached to specimen indicates the abaxial leaf surface has 15 marginal cells, 8-9 stomata rows per band, and a midrib of 24 narrow cells. Sichuan: 3500 m, Schneider 1429 (K). Illustration indicates abaxial leaf surface has 3 rows of shorter cells followed by 5 rows of longer cells and 15 rows of papillose cells, and then 7 rows of stomata and 22 midrib cells. Yunnan: Zhongdian, Haba Shan, 27º22'28 N, 100º05'50 E., 3347 m, Alpine Garden Soc. Exped. 309 (K). Illustration indicates abaxial leaf margin has 2-3 rows of shorter cells followed by 15 rows of papillose cells, stomata band with 10 rows of stomata and a partially papillose midrib, and leaf in x-section did not have reddish epidermal cells as usually seen in T. wallichiana and its allies, but the cells were very large as generally seen for T. florinii. 3. 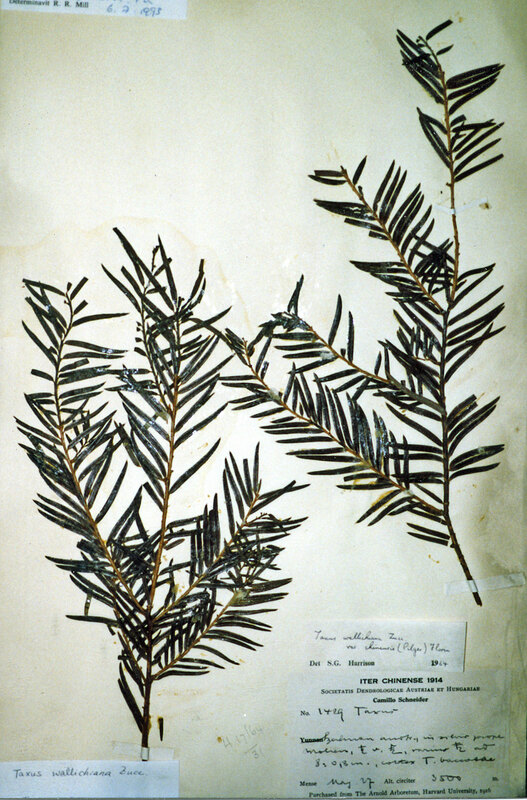 Taxus suffnessii Spjut, J. Bot. Res. Inst. Texas 1(1): 222. 2007. Type: MYANMAR. North Triangle (Wring Burma above Ahkail), 9000–10,000 ft, in forest and thickets, young leaves bronze, shrub or small tree—24 May 1953, Kingdon Ward 20902, holotype: A! (with seed, leaf with 12–13 stomata rows/band); isotype: BM! (leaf with 16 stomata rows/band, lacking papillae across 2 cells from margin). Tree or shrub; branchlets unequally divided, gray to purplish on older growth; bud scales 3–4 seriate, persistent to the 3 rd yr or longer, paleaceous, indurate, grayish, deltoid, closely to loosely adnate, lower scales concave with a distinct midnerve, uppermost scales slightly cuspidate and aristate, ca. 3 mm long and 2 mm wide. Leaves lacking on older twigs, nearly two-ranked, overlapping slightly, oblong to slightly elliptical or widest above the mid region, straight, mostly ca. 1.5 cm long, 3.0 mm wide, 250–350 µm thick, bronze to blackish green and concave above to a rounded or acutely keeled midrib, yellowish-green and convex below to a rounded keeled midrib, abruptly revolute near margins. Upper (adaxial) epidermal cells quadrangular in T-sect., or taller than wide, to 60 µm tall and 50 µm wide; lower (abaxial) non-stomata epidermal cells not as large, 12–25 µm high and wide, quadrangular, papillose to near leaf margins; papillae prominent, globose, in 3–4 rows, notably medial on marginal cells and marginal on midrib cells or equally developed on accessory cells in a stellar arrangement; stomata 12–20 rows/band. Male cones not seen. Female cones maturing on current season growth, scales overlapping in 5–6 ranks; seed appearing succulent or deformed, conical, dark colored with notable yellowish neck, ca. 3 mm long, 1.5 mm wide. Suffness yew. Rare, E Himalayas: Endemic to Myanmar. Taxus suffnessii has perhaps more ancestral features than other species in the genus. These include the relatively large bud-scales with a distinct midnerve, the numerous stomata on leaves—up to 20 rows—in bands that are scarcely differentiated from adjacent epidermal cells, and the papillose cells that extend across the midrib and to the margin, or nearly so (0–2 cells from margins). 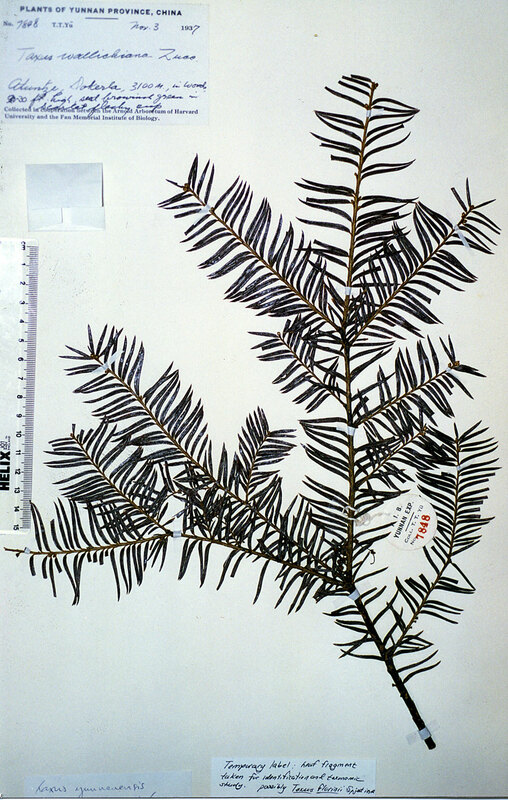 Additionally, its phyllotaxy is most similar to that of Pseudotaxus (Nothotaxus) chienii, Taxus chinensis and T. brevifolia (Pacific NW America). 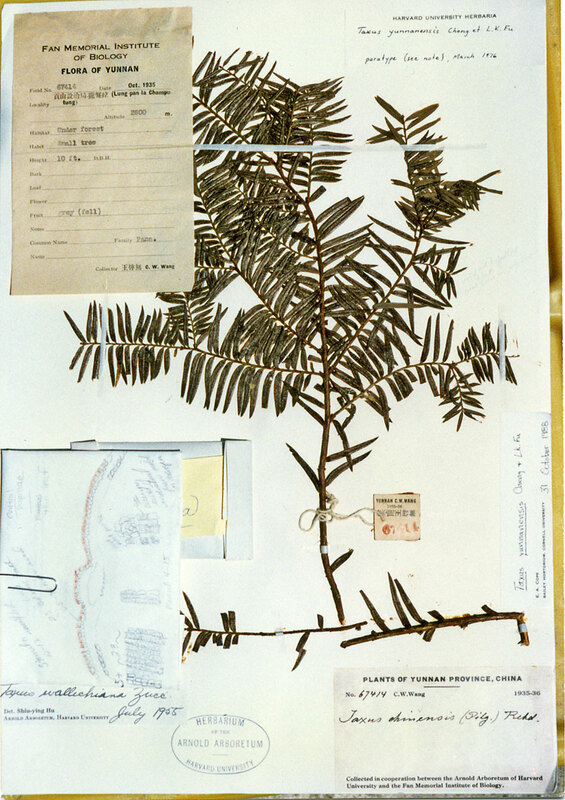 Its antiquity is further evident in comparison to the Pacific yew (T. brevifolia) by the similarity in branching, paleaceous bud-scales, and tall angular leaf epidermal cells. 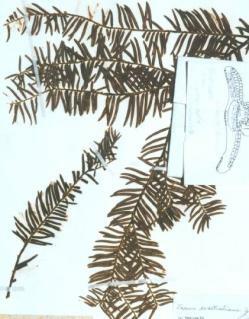 Ironically, Kingdon Ward noted T. suffnessii to occur “in thickets,” while in this paper T. brevifolia var. reptaneta is described as a thicket forming yew. The key difference between these species is that T. suffnessii has more stomata on its leaves. Its accessory cells also have papillae in concentric (stellar) patterns rather than aligned in rows. 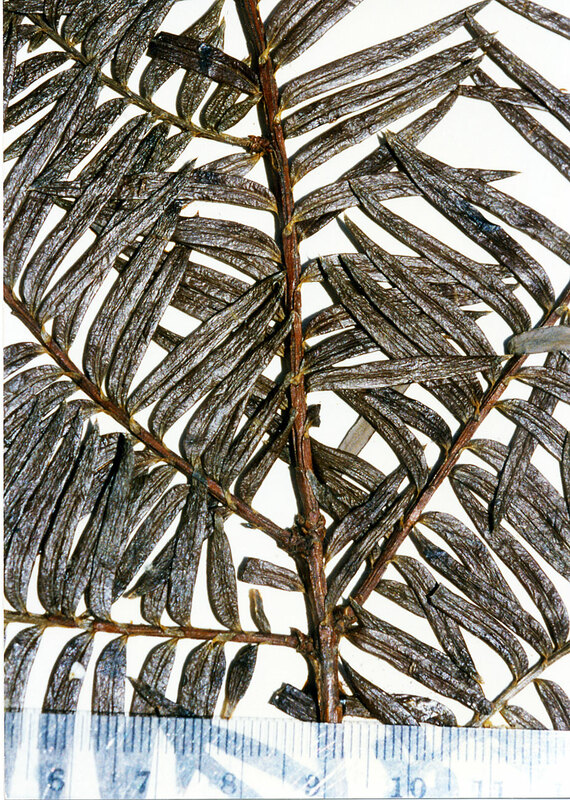 The bronze-colored leaves—reported by the collector, which are still retained in dried specimens—are also distinctive in the type. Taxus suffnessii, however, will most likely be difficult to distinguish from T. wallichiana; it differs by the smaller, more polished, nearly nerveless bud-scales, and sometimes by the older reddish orange branchlets as in the typical variety in NE India, in contrast to a purplish color in T. suffnessii. Intermediates may be recognized in specimens collected by Kingdon Ward 21901 from W Central Myanmar and Beer 25316 from Nepal (above Sedua, 9400 ft.). These have slightly larger bud-scales with a midnerve evident above the mid region of the scale. 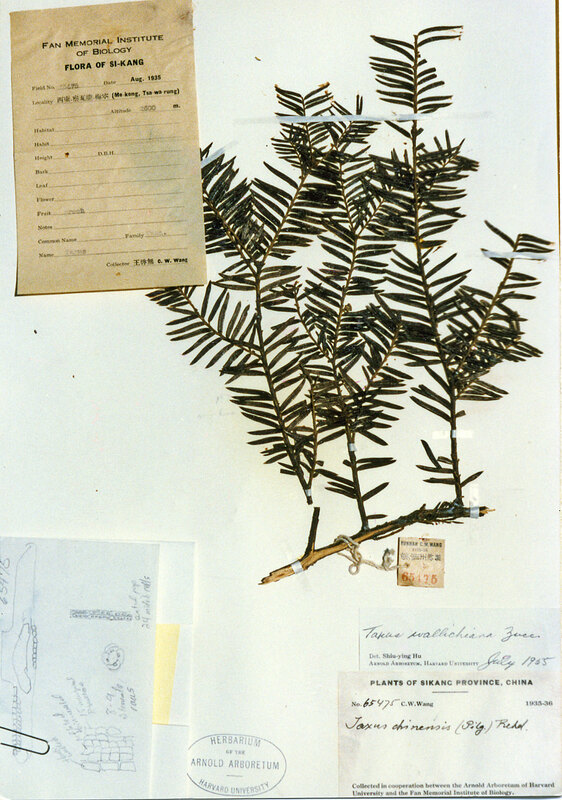 Taxus suffnessii is named in honor of the late Matthew Suffness in recognition of his dedication to screening natural products in the search of new drugs to treat cancer, and the strong encouragement I received from him in this endeavor. He became Chief of the Natural Products Branch in the National Cancer Institute after Jonathan Hartwell retired in 1976, following a brief leadership by John Douros. In 1986, Dr. Suffness became more involved in extramural contracts, often serving as consultant to various drug discovery groups. He focused on identifying novel leads that showed promise for development as new anticancer drugs, one of which was taxol. It is ironic that a major compilation on taxol research to which he served as sole editor (Suffness 1995) would not appear until just after his death from cancer in the spring of 1995. Representative specimens: Myanmar: Upper Burma, Hkyet, 27º45' N, 97º50' E, 9000–10,000 ft., Kingdon Ward 13003 (BM); Myintkyina, Sumprabum, 8600 ft., Hla & Koko (K); W Central Esakan, 6400 ft, in thick forest, Kingdon Ward 21901 (A).